Grandmaster and former national champion B.Adhiban made the most of his opportunities to beat Brazilian Grandmaster Alexander Fier in the second round and advance to the third round of the chess World Cup here. After drawing the first game as white Adhiban made good use of his opportunities as Fier went berserk while trying to attack and lost a piece and the game soon after. The other Indian left in the fray -- Grandmaster Krishnan Sasikiran -- again did well to hold the Russian world number nine Sergey Karjakin to tie the two games match 1-1 and set up a tie-break contest to start with the rapid games. Chinese teenage sensation Wei Yi continued with his demolition act and ousted highly-regarded Alexei Shirov of Latvia after winning the second game. 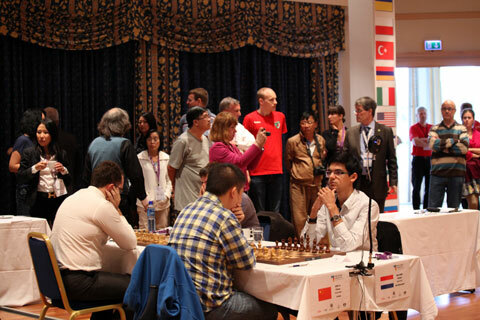 In the first round, Yi had beaten Ian Nepomniachtchi of Russia. 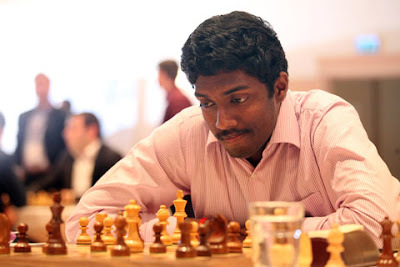 Sasikiran plays the tiebreak against Russian Sergey Karjakin on Friday - watch live India time 6.30 pm. Will he go to Round 3 as well? 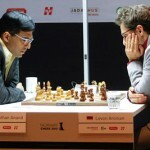 Among the higher seeds, Levon Aronian of Armenia, Alexander Grischuk of Russia, Fabiano Caruana of Italy and Vassily Ivanchuk of Ukraine cruised in to the third round effectively at the expense of Mikhail Markovof and Dariusz Swierczof of Poland, Yu Yangyi of China and Ray Robson of United States respectively. However, Gata Kamsky of United States and former world champion Vladimir Kramnik of Russia were stretched to the tiebreaker by Russians Alexander Shimanov and Mikhail Kobalija. Among other fancied players, Anish Giri of Holland accounted for Li Chao of China for the second time in two days while Hikaru Nakamura of United States did not disappoint his fans and moved to the last 32 defeating Eltaj Safarli of Azerbaijan by 1.5-0.5 margin. Adhiban stole the thunder showing determination and skill to hold a difficult position against Fier. It was a Four Knights opening by Fier that gave excellent position to the Brazilian as white but he soon crumbled impatiently while going for a quick checkmate with a piece sacrifice. Adhiban digested the extra piece with remarkable ease and proved that white’s attack was only optical. Sasikiran went for the trusted Breyer defense as black against Karjakin and the Russian could not do much despite having the experience of playing at the top level. The game was drawn in just 23 moves. Important and Indian results round 2 game 1: Evgeny Tomashevsky (Rus) beat So Wesley (Phi) 1.5-0.5; Alexander Morozevich (Rus) beat Rafael Leitao (Ger) 1.5-0.5; Gata Kamsky (Usa) v/s Aleksandr Shimanov (Rus) 1-1 goes to tiebreak; Alexei Shirov (Lat) lost to Wei Yi (Chn) 0.5-1.5; Alexander Grischuk (Rus) beat Dariusz Swiercz (Pol) 1.5-0.5; Krishnan Sasikiran (Ind) drew with Sergey Karjakin (Rus) 1-1, goes for tiebreak; Fabiano Caruana (Ita) beat Yu Yangyi (Chn) 1.5-0.5; Julio Granda Zuniga (Per) beat Peter Leko (Hun) 1.5-0.5; Anish Giri (Ned) beat Li Chao (Chn) 2-0; Leinier Dominguez Perez (Cub) beat Alexander Onischuk (Usa) 1.5-0.5; Ray Robson (Usa) lost to Vassily Ivanchuk (Ukr) 0-2; Hikaru Nakamura (Usa) beat Eltaj Safarli (Aze) 1.5-0.5; B Adhiban beat Alexandr Fier (Bra) 1.5-0.5; Anotn Korobov (Ukr) v/s Baadur Jobava (Geo) 1-1, goes to tiebreak. Tromsø, Norway: Grandmaster Krishnan Sasikiran kept himself in the hunt by holding Sergey Karjakin of Russia to a draw in the first game of the second round of World Chess Cup here on Wednesday. After beating Romanian Constantin Lupulescu in the tiebreak games, Sasikiran took it easy in the first encounter of the two-game mini-match and gave little chance to Karjakin, ranked ninth in the world currently. Grandmaster B Adhiban, however, could not make use of a good advantage and drew with Brazilian GM Alexander Fier after an opening tussle. Former national champion, Sasikiran surprised Karjakin by going for the King's Indian attack as white. Karjakin spent more time in the opening but it was clear that the Russian was well-prepared and was only trying to remember the best moves. As the middle game approached, Karjakin got his counter play rolling on the queen side and Sasikiran had to play a bit cautiously to avoid giving any leeway. The minor pieces changed hands and when Karjakin traded the queens after which there was nothing left to fight for. The Russian proposed the draw that was accepted. The game lasted 44 moves. Adhiban missed out on gaining the lead. Fier came up with the Noteboom variation where the Indian opted for the razor-sharp Marshall gambit. Very early in the opening, Fier decided to part with his rook for a minor piece. In established theory that was quite unplayable and the Brazilian was soon under pressure. The game, however, took a different route and Adhiban as a result spent a lot of time in the middle game, thereby falling a little under time pressure. 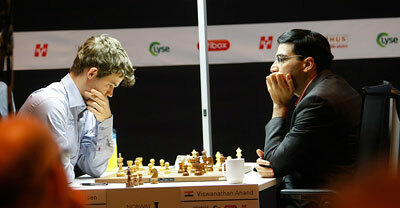 Sensing trouble, the Indian proposed a draw after just 20 moves which Fier gladly accepted. After a few surprises in the opener, most of the higher ranked players got off to a good start in the first game of second round in this USD 1.6 million knock-out event. 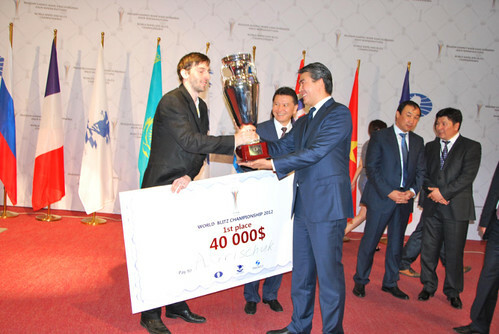 The day saw top players like Alexander Morozevich and Alexander Grischuk of Russia, Gata Kamsky of United States, Anish Giri of Holland and Fabiano Caruana of Italy registering victories over lower rated opponents. 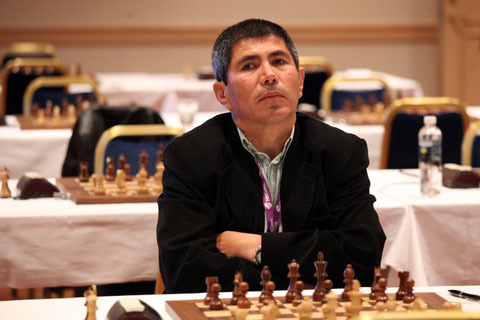 Julio Granda Zuniga of Peru, however, sprang a major surprise defeating Hungarian Peter Leko. Isan Ortiz Suarez from Cuba suddenly lost to French GM Maxime Vachier-Lagrave in a position with a huge advantage. Alexander Morozevich blundered in a winning position but his opponent Rafael Leitao didn't see the winning shot and instead lost. Shakhriyar Mamedyarov didn’t convert a huge advantage against Maxim Matlakov, while Wang Hao got a three-time repetition in a lost position. Local hero Jon Ludvig Hammer, who defeated Sergey Movsesian in the previous round, drew with David Navara in a game where he had a better position, although it wasn't winning as he'd thought after the game. Some players preferred not to take any risks in the first game and didn’t mind a short draw. 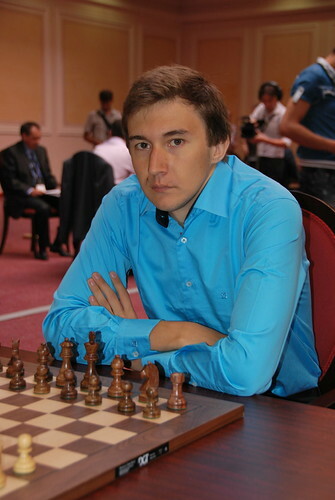 Peace agreements were signed relatively quickly in the games Dubov-Ponomariov, Bacrot-Moiseenko, Jakovenko-Eljanov, and Lysyj-Aronian (pictured above). 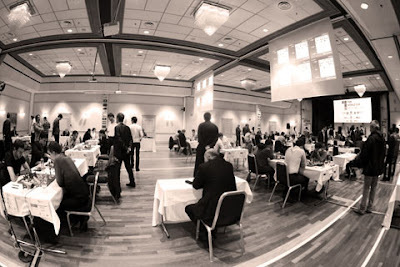 The others fought for many hours but the positions remained balanced in the Kobalia-Kramnik and Svidler-Bologan games. In the 12 decisive games the victories for White outnumbered Black by 10 to 2. 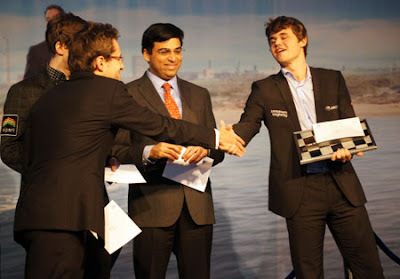 Only Vassily Ivanchuk and Maxime Vachier-Lagrave won with the black pieces. Shakhriyar Mamedyarov had a winning position but lost his advantage in one move. 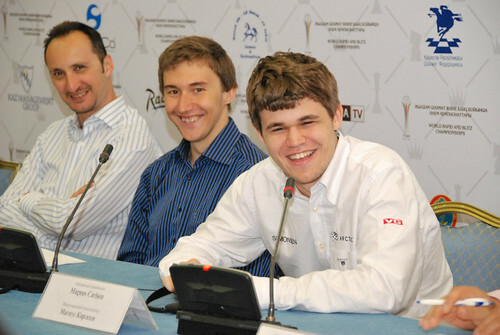 "Seems I’m getting old if I cannot win such positions," Mamedyarov wrote on his Facebook page. 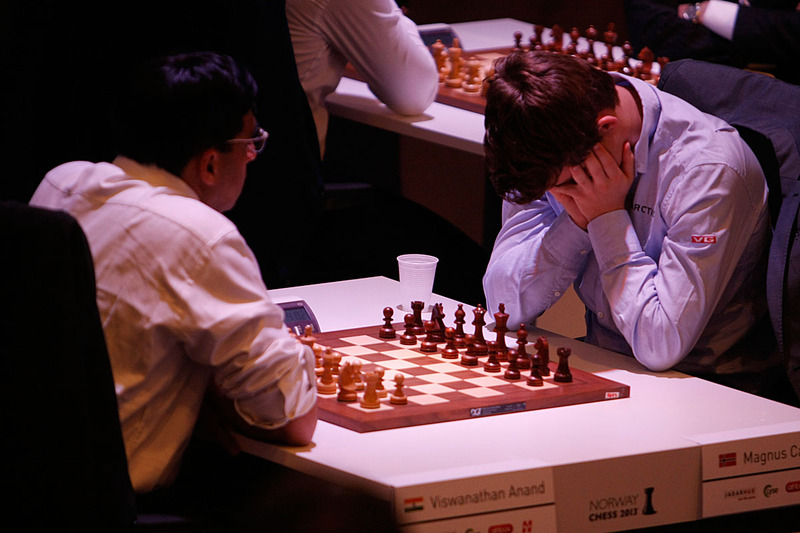 The World Chess Cup is a part of the next World Championship cycle. The event started with 128 players but half of them were knocked out after the first round, including Parimarjan Negi and G Akash of India. Each round, except the final, is a mini-match of two games followed by encounters of shorter duration in case of tied result. Important and Indian results of Round 2 game 1:Igor Lysyj (RUS) drew with Levon Aronian (ARM); Evgeny Tomashevsky (RUS) beat So Wesley (PHI); Alexander Morozevich (RUS) beat Rafael Leitao (GER); Gata Kamsky (USA) beat Aleksandr Shimanov (RUS); Alexei Shirov (LAT) drew with Wei Yi (CHN); Alexander Grischuk (RUS) beat Dariusz Swiercz (POL); Krishnan Sasikiran (IND) drew with Sergey Karjakin (RUS); Fabiano Caruana (ITA) beat Yu Yangyi (CHN); Julio Granda Zuniga (PER) beat Peter Leko (HUN); Anish Giri (NED) beat Li Chao (CHN); Leinier Dominguez Perez (CUB) beat Alexander Onischuk (USA); Ray Robson (USA) lost to Vassily Ivanchuk (UKR); Hikaru Nakamura (USA) beat Eltaj Safarli (AZE); B Adhiban (IND) drew with Alexandr Fier (BRA); Anotn Korobov (UKR) beat Baadur Jobava (GEO). World No. 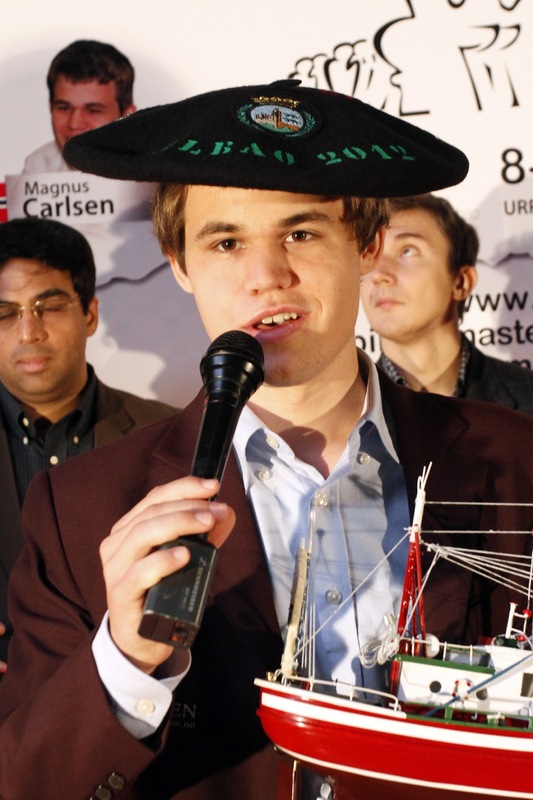 1 Magnus Carlsen going into the third day at the Astana World Rapid Chess Championship 2012 'chuk'ed his title win with back-to-back losses to Vassily Ivanchuk and Alexander Grischuk in the 12th and 13th rounds. In fact, he came close to losing the last round as well against Veselin Topalov. The three winners: Veselin Topalov of Bulgaria (third), Sergey Karjakin of Russia (World Champion) and Magnus Carlsen (second). Russia's Sergey Karjakin - with only one loss to Magnus Carlsen - steady performance and quality chess is the new World Rapid Chess Champion. Karjakin quickly got over his Carlsen debacle to post four wins on the final day! The world's best players are in Astana for the first-ever World Rapid Chess Championship that began today in Kazakhstan. Five rounds were played on the first day of the tournament. Sergey Karjakin and Magnus Carlsen both notched up four wins and a draw each to lead the field with 4.5 points each.